"Hiking camping equipment" is a phrase that smooshs together two separate universes. If only astrophysicists could do the same! Equipment used for hiking (gear) is made for trail safety and comfort. This includes overnight supplies for shelter, cooking, and making camp along a hiking trail. Camping equipment, purchased by car campers, is made for overnight safety and comfort - but not used by backpackers, who fuss over weight and portability. The hiking universe does overlap the car camping universe, however, and that's why you need to read this before you buy hiking equipment, or invest in camping gear. You want gear that can pull double duty! Hikers want lightweight hiking gear, while car campers don't check for weight in a flashlight or sleeping bag. Campers want comfort. So do hikers, but most are realistic about the direct relationship between weight and comfort. For example, a sleeping bag liner might give enough comfort during warm dry months, allowing you to leave the bag behind. Hikers need less gear on a backpacking trip, because they understand how to make camping equipment do double duty. Campers can get away with "just one use" camping equipment. See these comments about bandannas for an example. Campers may stay in one spot for many days in a row, while backpackers generally pull up camp after just one night. Thus, hikers need camping equipment that is fast and easy to set up/tear down in all kinds of weather. Hikers want camping equipment to use as small a footprint in the backpack as possible. Campers are only constrained by the size of their vehicle! Campers anticipate eating well, really well, including cold bottled beverages and fresh eggs for breakfast. Hikers are ok with the idea of dehydrated food, counting calories, and eating portion controlled meals. Hikers use lightweight stoves and only have one "burner" at a time, so meals must be planned carefully. Campers can use campfires for cooking, but generally rely upon heavier double burner stoves with more heat control options. Hikers can reach places campers can't, and their hiking/camping equipment is built around comfortable and safe trail time to achieve a hiking objective. Campers have a vehicle to access a road, in case a medical or weather emergency arises, and so have less planning to do for a camping trip. Campers might not hike, but hikers staying out at least one night need to camp! So hikers need to have a larger outdoors skill set, along with some serious hiking camping equipment. 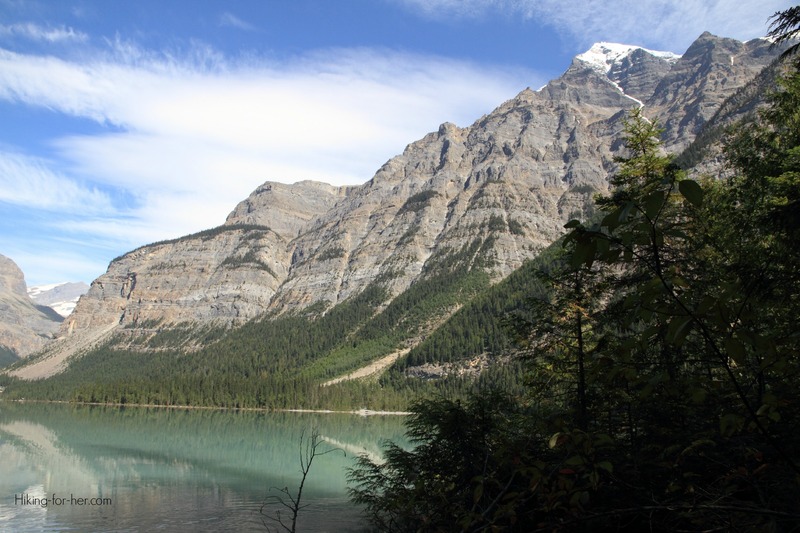 Only hikers can access Kinney Lake (Mt Robson Provincial Park, B.C.) but when they get there, they can camp! What should be the same is the quality of the hiking camping equipment. But in my experience, it isn't - unless you know which brands to choose. It's possible to purchase inexpensive camping equipment and be disappointed when it's too heavy and/or too flimsy for hiking usage. Backpack camping gear is a sub-set of camping equipment. Durability. If it breaks when you're 25 miles from the trail head, that's trouble! Size. Is it going to hog space in your pack? Look for the smallest version of it that will do the job you want it to do, or collapsible gear you can expand when needed. Performance. Stick with companies that have a long track record of making gear that won't jam, clog, break or fall apart under heavy usage. Weather proof. A camper can eat and sleep in the car during a downpour or snow dump. A hiker still needs to make dinner and sleep outdoors, so gear that is waterproof is better than water repellent. Easy to use. If the stove needs a 5 page booklet to teach you how to light it, get something easier to use in "real" conditions. I'm a firm believer in bargain hunting for hiking camping equipment. If you want to use the same companies I use for hiking gear deals, go here. But sometimes I am willing to pay a higher price for bombproof hiking gear, like my titanium cookware set. You're building a repertoire of reliable hiking camping equipment to be used for many years into the future. And to be handed down to the next generation, in the case of a titanium cookware set that is handled with care, or a Coleman lantern treated with respect. If you're interested, my hiking equipment list, honed by many decades of trial and error, is ready for your perusal right there. If you're just easing into the idea of backpacking, and you are up for the adventure of a camping trip, why not choose a campground that offers you easy access to several hiking trails? You can day hike every day, but have some of the comforts of home in the evening, including a cooler filled with food, a roomy tent, camp chairs to rest your weary bones, and a campfire for roasting marshmallows. Use my tips for planning the best car camping for hikers experience! now it makes sense, right? Have I convinced you that hikers camp, and therefore need hiking camping equipment? But now you realize that camping hiking equipment doesn't have universal applicability. When scanning ads or trolling through gear stores, as a hiker you want to head for the backpacking and hiking items, not the camping equipment. The brands will be different. I use a two burner Coleman stove when I use my car as a base camp for serial day hikes at Mt. Rainier National Park. and a JetBoil on short snowshoe dayhikes. Note: They use different fuel canisters, and need to be set up and used differently. Maintenance and used fuel canisters are also a consideration. Read about backpack chairs -vs- camp chairs. Or take a look at a portable, rechargeable, independent power station camping lantern that's way too heavy for backpacking. a car camping sleeping pad compared to a backpacking pad. Here's a great example of gear that can perform well for backpacking as well as for car camping: camp shoes. For a backpacker, a lightweight and indestructible pair of shoes for foot protection during a water crossing is invaluable. They're also something nice to have at the end of the day, to get out of those cramped boots or trail shoes. A camper also knows how relaxing it is to have a pair of camp shoes, while making dinner or puttering around the campsite. Here's what I use: good old fashioned Crocs. Are you beginning to see that acquiring hiking and camping equipment could be an expensive (and fun) habit? But it's worth some thoughtful planning for your safety, comfort and budget, isn't it? Hike and camp to your heart's content, and maybe even use the same equipment. Just don't forget to plan your camping hygiene essentials! 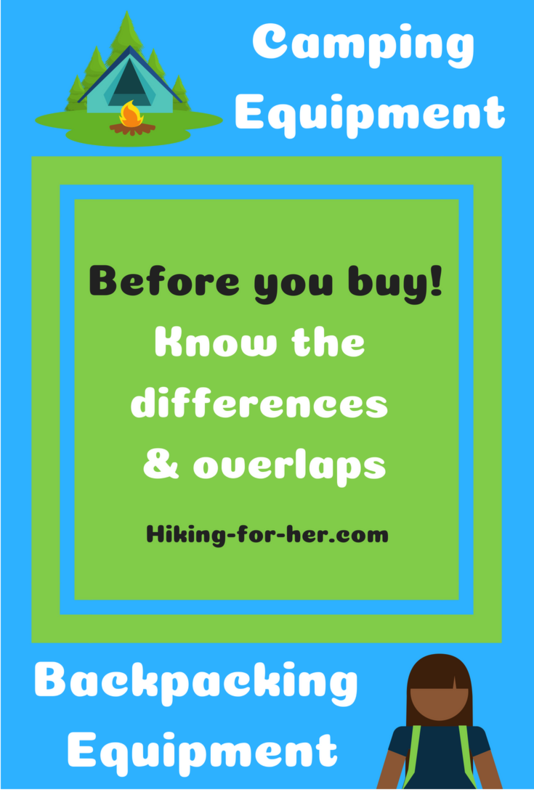 Interested in more hiking gear tips? Some of these links are affiliate links, meaning that I trust REI's customer service policy enough to recommend them to you. 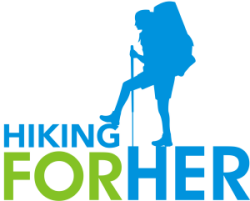 If you purchase through the link, Hiking For Her will receive a small amount of money - without costing you anything extra. Your support is greatly appreciated, and keeps the best hiking tips flowing freely (literally) through the rest of the links on this page.